Colour is such an important aspect in how we dress our environment. It can dictate a mood, it can create a sense of space and it can give the illusion of light. 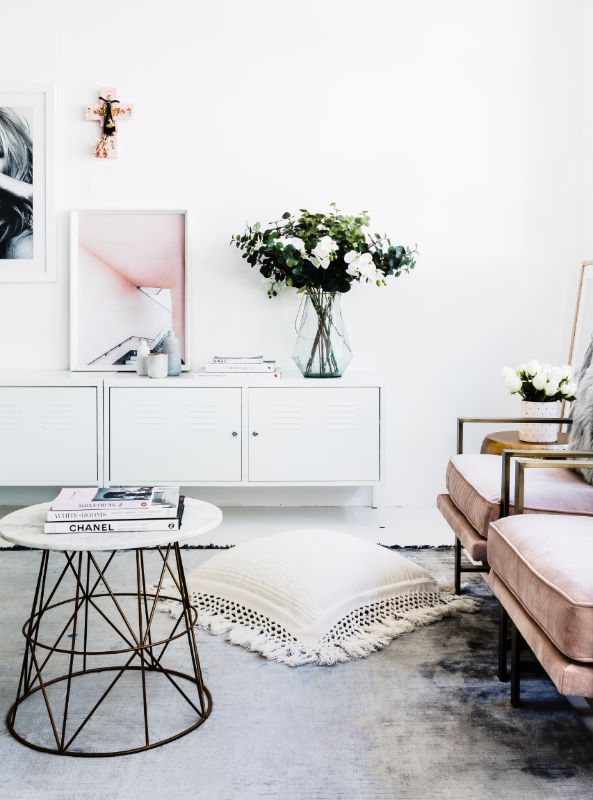 Applying whites or neutrals into an interior is often considered the safer option, however with so many thousands of ‘whites’ to choose from, white is certainly not for the faint-hearted. With so many variables to consider, working with white can be daunting, frustrating and extremely tricky on the eye. When the sample pots collection is building and the walls of your home is starting to look like a Monet, it’s time to get an expert eye on the job and get the low down on which white! So, let’s undress the whites in a quick overview and then look at some of the more popular ‘whites’ from Dulux so you can work out which white is going to work for you. UNDERTONE // WARM // COOL Technically, ‘white’ is just that. White. In this context however, we are referring to any colour that has no obvious colour. This also includes neutrals that are otherwise classified as beige, grey or currently trending ‘greige’ which is as neutral as you can get. Whites or neutrals are sub-categorised into two main categories being warm or cool. Albeit they may appear to be a plain white in isolation, there is always an undertone or base colour, which is usually blue, red or green and this base dictates how the colour is best applied to any given space. Colours with a warm undertone (beiges) are typically best in a more traditional setting as it is a harmonious base for the yellow or red tones found in traditional finishes like red brick, jarrah or blonde timber flooring and incandescent lighting. Cooler undertones however like blues and some greens (greys) are much more popular in a more modern setting. These colours do have the tendency to be clinical if used in abundance, so it is advised to introduce some warmth and textures to the space in soft furnishings and accessories to provide an inviting setting. Referencing modern finishes like concrete or using soft furnishings seen typically in scandi vibes are often a contemporary approach when using cooler colours. There are selections of colours available that sit right in between beige and grey and are currently referred to as ‘greige’. They are super neutrals, not obviously warm or cool and tend to interact with their environment before they show them true selves. These colours can be a great colour to work with if your not looking for any specific style in your space, ensuring the right one is applied. Working with undertones can be difficult especially when working with whites, but is does come with practice and having a well trained eye to assist with this can save time and money on trial and error. FULL STRENGTH // HALF STRENGTH // QUARTER STRENGTH Your preferred paint supplier will offer colours in varied strengths. This allows you to add or reduce the impact of the undertone to the colour. There is usually little to no noticeable difference between half and quarter strength, so if you are happy with a colour but just want to vary the tone try knocking it back from full strength to quarter or make it more of a feature by bringing it up from quarter to full strength. If needed, you can try to manipulate the perception of colour and use a full strength colour in a north facing wall and a half or quarter strength version of the same colour on a south-facing wall so it appears the same throughout the space. Equally, when applying colour to an exterior, it will usually appear 30% lighter outside than what it appears on the swatch. Playing with the colour strength can also help you get the impact you are after once you have found the colour you love. ASPECT // LIGHT Aspect and natural light plays such a huge role in how colour is perceived. North facing rooms and exteriors will undress a colour and show the colour in its truest form. East facing rooms and exteriors will deliver a yellow additive to any given colour, warming it up especially in morning light. South facing rooms and exteriors reflect a cooler blue / grey light which can also intensify the chosen colour in these surrounds. West facing rooms and exteriors throw a warm orange light which gets even warmer during the hotter months of the year. Keeping these colour shifts in mind can help determine which colour undertone will work best in your space and how it will interact with the light once it’s applied to the required surface. Vivid White // Most true ‘white’ of all the whites, can be clinical and has a high LRV (Light Reflectance Rating) so it’s not advised to be used in excess in exteriors. This is a very popular colour, and has pretty much no undertone. It is a great option for a space that you want to remain versatile, fresh and bright however in north facing spaces it can be too bright so introducing lots of textures, depth of tone and pops of colour or variations of neutrals in the space is really important. Great clean colour to apply to any timber skirting boards, architraves or decorative trims as it will provide a clean contrast between any flooring and any wall colour. Antique White USA // Warm white with a subtle yellow undertone, this traditional colour works well with timbers. If it appears too yellow in your space try to avoid applying it in easterly / westerly drenched lights. Also, try using furniture and finishing’s that are of a similar tone (timbers, bricks, warm stones) to neutralise it. Applying cooler colours in the space will bring the yellow out in the wall. Natural White // Warm white with a balanced red / yellow undertone. 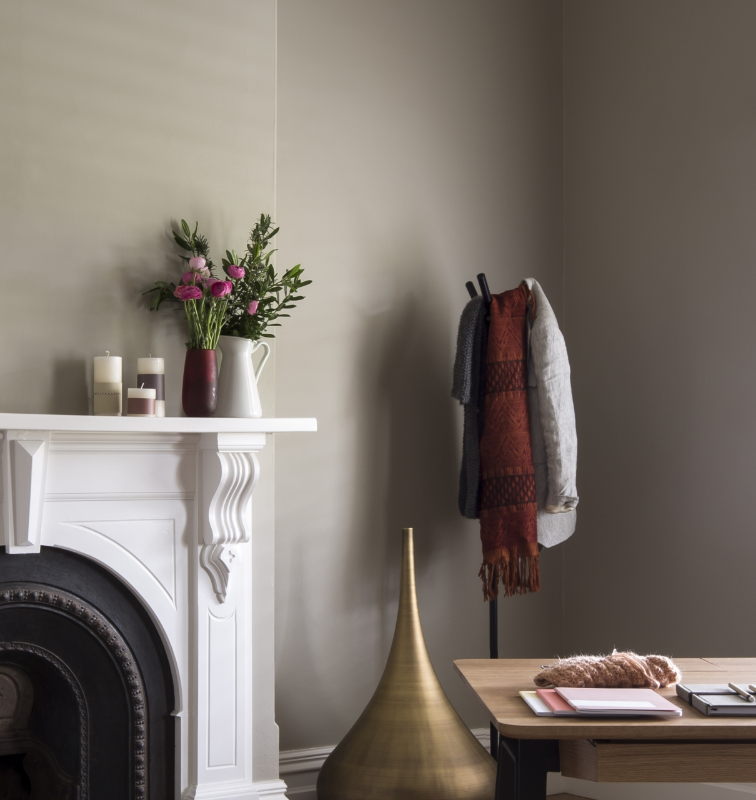 A subtle ‘greige’ and the lightest of the warm whites offered by Dulux. This is a perfect colour to be applied to most spaces regardless of their style. Integrating natural materials like raw timbers, stones and brass will bring this colour to life. Whisper White // Contemporary cool white with a subtle yellow / green base creating a warm and soft environment. This colour inspired by nature, works equally well on an exterior as it interacts with greenery really well. Would be stunning to compliment a dark charcoal roof or façade trims. If applied to interiors, introducing lots of plants in interesting concrete pots will be a beautiful way to compliment the undertone. Tranquil Retreat // Cool white which offers depth of tone, depending on where it is applied. Often used in quarter strength in interiors, it can throw either a subtle blue or more often a subtle green. A fresh option when contrasted with Vivid White trims and a dark flooring option, this is a modern colour that can create space and mood. 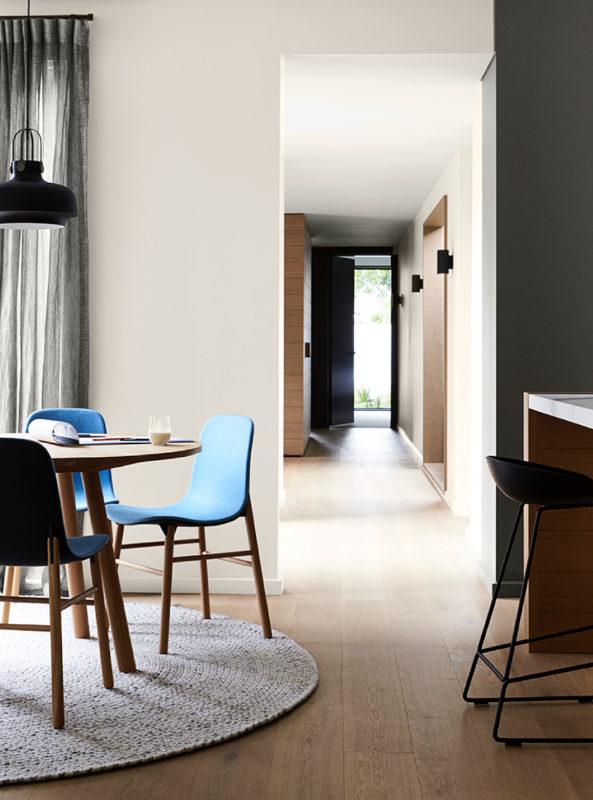 Lexicon Quarter // Blue based cool white, creating a fresh, modern and contemporary space. This crisp colour in full strength can throw an obvious blue / grey especially in a south facing environment. If you love the colour but want less of the ‘blue’ showing through, try it in a quarter strength or perhaps neutralise it with cooler tones in the flooring (slate, blue stone tiles, washed timber flooring). The key is to try and bring warmth to the space in small amounts of warmer tones that sit between neutrals. E.g. Cool wall, cool or greige floor, greige sofa, warm and cool combo cushions or throw. This colour is perfectly complimented by open spaces and modern black trims in light fittings, tap ware or handles to dress the space. QUICK TIPS // TRICKS Complementary colours in your interiors and décor will make the undertone of the wall white stand out. Reference the same colour as the undertone in your décor to create a harmonious balance of tone and the colour will sit back restfully. I.e. avoid green-based neutrals when working with red brick or red timbers unless you want the red trims to really pop and warm up the space. Bring ‘white’ to life with texture, pattern, accents of colour and tonal variation. Mix materials like timber, stone, metal and leather to bring dimension and interest. Pops of colour in soft furnishings is where you change the personality of the space quickly and cost effectively whenever you feel like it. Brighten a naturally dark room with a cooler and / or more intense colour than the rest of the space. Never select a colour based on an image, what you have seen in another house or without applying the short list of colours to your walls. Assess the colours in morning, noon and night light. Turn the ceiling lights on and off and assess the interaction. There are so many variables to consider including the broader selection of whites available from our other mainstream and boutique paint manufactures, but as long as you have made an educated decision and are happy with your choice don’t worry about what is trending or what the neighbours are doing. Be bold. Be brave. Make a space you love for now. At the end of the day, it’s just paint and can be replaced in time. If you're feeling like a set of trained eyes would be of value to you on your current or upcoming project, you can make a booking for an Initial Design Consultation below. We come to you, assess your space and make the most suitable colour + style recommendations to deliver your objectives. Otherwise, check out our paint palettes available to buy now from The Palette Store. We'd love to hear from you and assist in bringing your vision to life! Don’t forget to follow us on social @spacesresser using the links below for weekly colour + style inspo! Newer PostDress your holiday table with little fuss + lots of cheer!